Photo courtesy Xanterra Parks and Resorts. Good news for Zion National Park lovers. 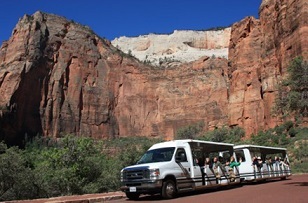 Zion Lodge has begun narrated tram rides through this spectacular canyon. From April through October, only shuttle buses have been allowed on the park's roads. The only exception for visitors were lodge guests. Until this summer. The tram departs from the lodge bus stop Mondays at 5 p.m. and Wednesdays and Fridays at 5:30 p.m. The 60- to 75-minute trip takes passengers north until the road ends at the Temple of Sinawave, stopping at the Great White Throne for a photo op. Cost is $14 for ages 17 and up, $7 for children five to 16 years old. Reservations can be reserved or purchased on a walk-in basis at the lodge's front desk. The tram carries 48 passengers and features an ADA ramp. Blankets are provided if temperatures turn cool.